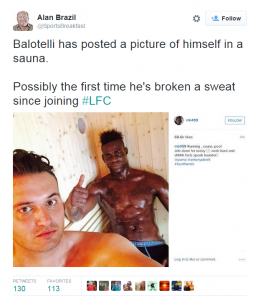 Although Balotelli has undeniable talent this has never stopped people taking a pop at him, and ex Manchester United Legend Alan Brazil is the most reason to troll him on Twitter. He really doesn’t seem to be able to catch a break with Marco Pedretti recently releasing a biography, describing times when he played alongside the striker calling him “a real pain in the neck” as a result of his constant pranks on his team mates and colleagues. Even so Pedretti goes on to state he is happy for the success Balotelli has achieved this far in his career.